The German DAX may follow its US and Asian peers lower on Wednesday as investors fret about trade tensions and slowing global growth. Overnight US stocks tanked and this morning across Asia markets are moving lower amid concerns over the inversion in the yield curve and confusion surrounding the US-China trade agreement struck between the US and China. Looking ahead on the economic calendar today, there are services PMIs from France, Germany, the eurozone and the UK which might impact trading activity, although volume might be lower than usual because US markets are closed. DAX finished Tuesday at 11335 losing €130.14 and crossing back below the 20-Day moving average as the bears were in full control moving the market lower throughout the whole session. Ending with a weak close near the low of the day sets a bearish note for today's session. However, prices are trading close to the key technical support level at 11265 which might trigger a rebound in the short-term. Selling could accelerate should prices move below that line and the next important support level is at 11050. 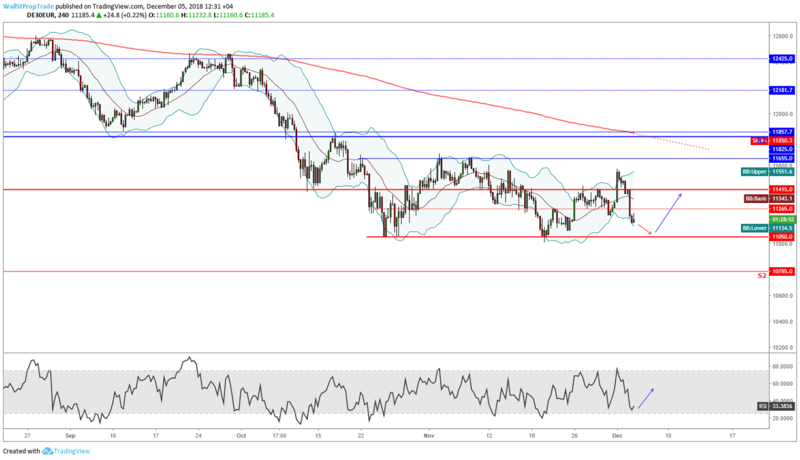 The RSI is starting to look mixed to bullish, suggesting things might start turning around in the next few hours although it is not indicating oversold conditions just yet.